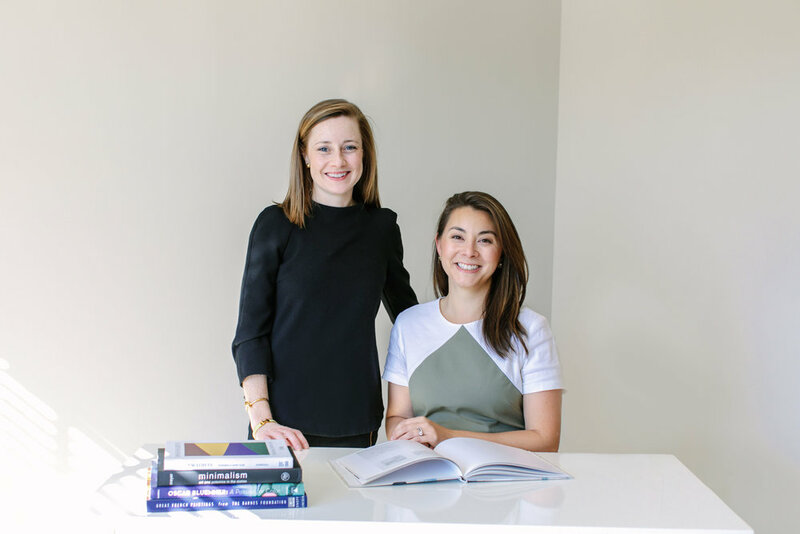 Katy Reis (pictured left) is the co-founder of Reis Leahy Art Advisors in Columbus, Ohio. Katy recently walked us through her path from Winston-Salem to the burgeoning Midwestern art scene. DeacLink: Please walk us through your path from graduation day to your current job. Katy Reis: Once I graduated, I began with an unpaid academic-year internship at the Corcoran Gallery of Art working for the Curator of Prints and Drawings. I simultaneously worked full-time at the National Gallery of Art in the gift shop during that time. Once that internship was completed, I took on two part-time roles at the Corcoran, one in the traveling exhibitions department and the other as membership director for Washington Project for the Arts which at that time was still part of the Corcoran (they are now an independent arts non-profit organization). Eventually, I took my final role at the Corcoran as Exhibitions Officer working with the Exhibitions Director on every exhibition from Old Masters to Contemporary Art. After doing that for a couple of years, I decided to join my husband in Columbus. I took a job in the Exhibitions department at the Wexner Center for the Arts and remained in curatorial most of my time there. My last few years at the Wex, I moved over to the Development Office working as Senior Development Officer in Individual Giving. Before I knew it, we had two children and I took a few years off to be with them before founding Reis Leahy Art Advisors with my partner Lauren Yen Leahy. KR: As much as I may have disregarded its importance as an incoming freshman, the core curriculum requirements unsurprisingly served their purpose. The subjects I postponed taking until I was a senior are now my favorite reading and research topics. Early in my college career, I enjoyed science, math and foreign languages. After realizing that I didn’t want to go to medical school, I chose to major in Spanish partially because the deadline was upon me and partially because I knew I wanted to go abroad and would complete most of the courses for the major while I was there. I enjoyed classes with my Spanish professors, but it wasn’t my passion. While I was studying abroad, I found myself perpetually in art museums and loving every minute of it. I had always taken studio art classes for my own personal enjoyment, but never thought I could make a career of them. It (finally!) occurred to me to take an art history class upon returning to Wake the following semester. That was the pivotal moment. I realized I loved studying art. I loved studio art critiques because I found myself thoughtfully analyzing the art of my peers and seeing the visual vocabulary from art history that informed their work. I was hooked. I didn’t know enough about the field to know what my next step would be, but I knew I wanted to do something related to art history. DL: How did you find and apply to the various positions you’ve held -online, inside reference, networking in person, WFU resources, other avenues? Do you have tips or suggestions for the student audience on networking, interviewing and applying for jobs? KR: Dr. Barnes and David Faber were both instrumental in guiding me towards career opportunities that might be a good fit for me. Ultimately, I took the internship with the Corcoran Gallery of Art and just kept jumping at every opportunity that came my way. I was fortunate enough to always work under supportive leadership who let me move into new roles as my interests grew and changed. It helped give me the experience I needed to do what I am doing today. Once you have your foot in the door, if you work hard, practice patience and work well with others, there are always colleagues who will help you get to where you want to go. KR: Truthfully, after reading DeacLink, I wish that resource had been around when I was a student. Though I know career services did a phenomenal job for many of my classmates, I always left my meetings there feeling like the opportunities were all geared towards the business school and communications majors, working with recruiters from major companies and corporations. Though they probably had options for students looking for careers in the arts, it was challenging to sift through everything else to find that. Deaclink seems like a great way for students to make their own future and network in a way that is necessary for a job in the arts. It gives information that someone like me was eager to find as a student. I didn’t know what art history majors did beyond being a professor. I knew museum curators and auction specialists existed, but I had no idea what a regular day was like for them. Having that information at your fingertips and then also having the opportunity to contact that person directly would have been enormously helpful in finding my current role in a little more efficient way. DL: What is your favorite part of living and working in Columbus? KR: It’s such an open and supportive city. DL: What is the most interesting thing going on in the art scene there at the moment, in your opinion? KR: I may be biased as a former employee, but I continue to be amazed by the quality of arts programming at the Wexner Center. And, they are in good company, the Columbus Museum of Art, Columbus College of Art and Design and Franklin Park Conservatory all have phenomenal programs too. They all bring in world-class artists who otherwise would not have reason to come here. I am fortunate to have quality art programming and still enjoy all the benefits of living in a smaller city. DL: What is your favorite part about working for yourself? KR: Flexibility and working with clients. No two collection objectives are the same which keeps research interesting and fun. KR: At this point, this is it. I get to do what I love and work with wonderful people. I can’t imagine myself doing anything else. DL: Do you have a kernel of advice you’d like to impart to the readers? KR: Be open to anything. You’ll surprise yourself. Be patient. I never thought I could or would start my own business when it first occurred to me 10 years ago to do so. But, when the time is right, you will know. Everyone in the Wake Forest arts community knows the name Cristin Tierney. Blazing a trail into New York's renowned Chelsea district in 2010, Cristin established a presence with her eponymous contemporary gallery. We recently learned what drove her transition from Wake English major to NYC gallerist. DeacLink: How has your career unfolded since Wake? Cristin Tierney: It has been a long and winding path. I opened my gallery in 2010 after having an advisory business for a number of years and doing projects in the art world and art market. Opening a gallery was a bit of an absurd thing to do at that point in my life. But, my desire to do so had a lot to do with the fact I had never really worked with artists. When I was younger, I thought I wouldn’t want to do this, but one of the best parts of being in the art world is working with artists. And gallerists are the people that spend the most time with artists and help develop their careers. That fact greatly influenced my decision to open up the gallery. Thankfully I had a lot of work experiences and connections in the art world, which also enabled me to get started. DL: How did you go about building a client base as an art advisor? CT: I worked as a consultant to Christie’s in the education department for years, and I was able to do client development through education. People that are interested in collecting want to learn about art before they start buying it. Often, these people were non-degree students and weren’t working towards a Master’s. The Director of the education program had recognized that these people were potential clients for the auction house. Often, they were super intelligent, accomplished and financially comfortable people that were hungry for more information. If you took them on and helped them develop their eye, they could become your clients. I helped Christie’s do that for years, and then I started doing it for myself. I ran private seminars and helped people acquire art privately and not just at auction. In turn, that led to a lot of referrals. CT: At Wake, I was an English major. I had an interest in art when I was younger, but I wasn’t really aware that you could be an art historian. My desire to pursue a career in art history came rather late while I was overseas. Wake had a rigorous program in France that introduced me to careers in the arts beyond the museum world. I learned that in some places, art is part of everyday life and is fabricated into daily culture. Upon my return, the professors in the art department were very supportive when I asked for help and for more information. DL: What do you think is the hardest part about breaking into the gallery world? CT: I never worked at a gallery before I opened one, but you have to know people to get a job. When we advertise an entry-level position, we get tons of resumes. And because it is an entry-level role, there is no easy way to sift through. When you have a small staff, you are much more likely to go with someone you know or someone who’s been recommended by a person you trust. For the bigger galleries, they must get so many, and I have no idea how they can decide. These days, more people gravitate towards roles with bigger galleries. Most students graduate with debt, and they have expectations about the art world. They are not taking the risk on a smaller gallery, where they could be more hands on, because a place like Zwirner seems more stable. There’s a predictability, corporate nature, and structure at the big galleries. But, it is also harder to get your foot in the door there, and there is high turnover. DL: When you are hiring, what kind of technical skills you are looking for? CT: We are immediately interested in anyone who can use Photoshop or SketchUp. Basic technical computer skills are very important. Programs like that are routinely part of a job, and if you don’t have to train someone how to use them, then you are more likely to keep them on. We also need people who are active and engaged on social media and who understand the back end of web programming. Additional languages are also helpful in terms of playing in the global art scene. We deal a lot with Latin America, so Spanish is great for us specifically. DL: New York is known as the art capital of the world. Do you think it is a hard community to break into? What advice do you have for students that are considering a move here? CT: It depends on the person and their personality. Often, younger people come up here right out of school. For them, the most important thing to do is to develop a network of older people that can help out and recommend you for different roles. Also, students and recent grads should be developing a network with their peers. Often times, your friends can tell you about the different jobs available, especially if they are already working somewhere. But in general, you should support your peers and go to each other’s openings. When you have your first exhibition or curate your first show, your network of friends show up, and they in turn can bring their writer friends and help you get publicity. CT: I think it would be good to introduce more art world professionals to students when they are younger. A limited amount of that happens now. However, it is hard. The center of the art world is New York, then it’s Los Angeles, but then you have to get people from those places to North Carolina. One of the reasons the Management in the Visual Arts class is so important is because it opens up people’s eyes and provides them with initial introductions. Continuing and expanding on the ideas of the program would be a great thing. DL: What’s the best kernel of advice you can think to pass on to current students and recent alums? CT: Take every opportunity, especially when you are young and don’t need to to sleep as much and aren’t addicted to creature comforts yet. Also, make sure you really belong to a community, and aren’t just there to leverage it.